FB Q2 earnings: Facebook stock spikes because everyone's clicking Newsfeed ads. 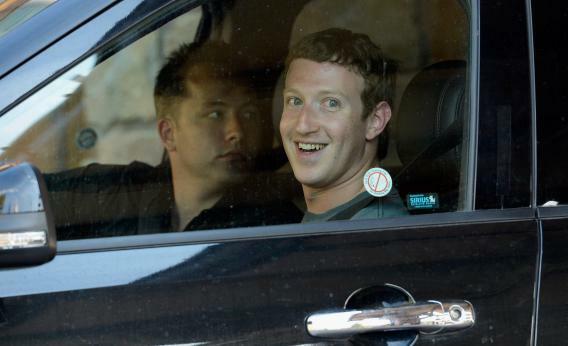 Facebook’s latest earnings report gave this man a lot to smile about. In its first year as a public company, Facebook saw its stock plummet, endured one privacy backlash after the next, and was generally assumed to have lost its mojo. On Wednesday, that assumption was proven false. Emphatically. In its second-quarter earnings report, Facebook revealed that it closed its first year since the IPO stronger than ever before, by almost any tangible metric. Revenue is up 54 percent. Ad clicks are up 43 percent. Ad prices are up 13 percent. The mobile market—the Achilles heel that drove the company’s stock price to embarrassing lows in the weeks after its IPO—has become the company’s greatest strength, with more people visiting Facebook on their phones and tablets every day than on their desktop computers. Soon the company will make more money from its mobile users as well. But here’s the most important statistic: For all the complaints and all the fed-up users who have pledged to quit the social network for good, more people are using it than ever before—and not only that, they’re spending more time on it than ever before. Some 700 million people around the world now log into Facebook on a given day. And at a time when Facebook was supposed to be losing ground to upstarts like Twitter, Tumblr, and Snapchat, its share of U.S. Internet users’ attention has actually held steady, or perhaps even increased, founder and CEO Mark Zuckerberg told investors. The same is true in other markets. Based on the company’s data, the notion that teens in particular are turning away from Facebook “just isn’t true,” he added. Just about every U.S teen who’s on the Internet has an account, and the number who use the site monthly or daily has held steady for the past year-and-a-half. Instagram, meanwhile, has continued to grow rapidly since Facebook bought it and now boasts 130 million active users. It still may be true that more people are growing weary of Facebook, as Pew Research surveys have found. But if so, it seems that they’re wearily trudging on—and clicking on an awful lot of Newsfeed ads in the process. Facebook’s stock spiked 20 percent in after-hours trading on the report and was still up 17 percent at last check.